The Chengdu J-20, China’s independently developed fourth-generation stealth fighter has entered service with the People’s Liberation Army Air Force (PLAAF), as revealed by the military channel of China Central Television (CCTV) on March 9. Early in 2011, the J-20 stealth fighter made its maiden flight in Chengdu, Sichuan Province. In November last year, the J-20 fighter made its public debut at the Zhuhai International Air Show. As a masterpiece of China’s modern air force, China’s first stealth fighter J-20 symbolizes the high speed of development in China’s national defense capacity. 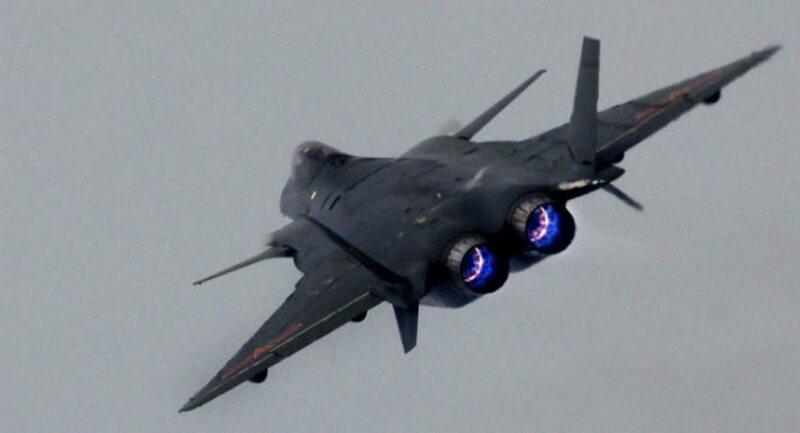 The Chengdu J-20 stealth fighter features a single seat, double engines, twin outward canted all-moving fins and diverterless supersonic inlet. Its canard (small forewing) design helps provide good supersonic performance, excellent supersonic and transonic turn performance, as well as improving short-field landing performance. The J-20 fighter has an internal weapons bay, making targeting beyond-visual-range air-to-air and short-range missiles possible. With camouflage paint, the fighter also has a low-observability. As Russia’s fifth-generation stealth fighter, the Sukhoi PAK FA, also known as the T-50, first flew on January 2010, a year earlier than China’s J-20. As yet, the T-50 fighter has not been put into service, reportedly due to a shortage of money, reports sina.com.cn. The Lockheed Martin F-22 Raptor air-to-air US combat jet, single-seater, twin-engine, can carry a total of 8,165 kg fuel, while the fuel tanks of the Chinese J-20 are able to hold as much as 11,340 kg, far beyond the F-22’s, according to sohu.com. The F-22 Raptor made its maiden flight early in 1997. And the last F-22 was delivered to the United States Air Force in 2012. It is highly maneuverable at both supersonic and subsonic speeds. On Feb. 24, 2017, the United States Air Force announced a plan to deploy the first F-35A fighter squadron in Europe as early as this Spring. Meanwhile, European countries have also set about equipping the Lockheed Martin F-35 all-weather stealth multi-role fighters. The development of China’s air force equipment is at full speed. In July last year, the Y-20, a large military transport aircraft developed by the Xi’an Aircraft Industrial Corporation, entered service with the PLAAF. Moreover, China is developing its new generation of long-range strategic bombers, as reveled by Ma Xiaotian, a general and Commander of the PLAAF, in September of 2016. “To build a strategic air force, we must have strong armaments, including advanced fighters, long-range bombers and a large transport aircraft,” said Zhang Wenchang, a military expert from the PLAAF.